It can be defined as the number of times our heart beats per minute while at rest. Normal resting heartbeat ranges from 60-100 times per minute. 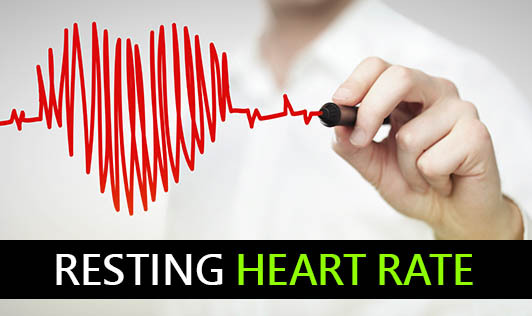 Resting heart rate differs from person to person according to their lifestyle. The best time to find out your resting heart rate is in the morning, after a good night's sleep and before you get out of bed. You can feel your pulse either at the thumb side of your wrist or on either side of your neck. Once you feel the pulse using three fingers, press lightly and then count the number of times you feel a beat for 30 seconds then double it, in this way you can calculate resting heart rate. There is a link between resting pulse and heart attack risk in men and women. A pulse that is faster than normal may be a signal of low cardiovascular fitness level. It can also predict heart risk. You can lower your resting pulse by exercising regularly e.g., walk, jog, bike, or do active sports. Sedentary individuals can have heart rates as high as 80 to 90 beats per minute. But regular, moderate exercise will gradually lower your resting heart rate as such as 10 to 20 beats per minute. This signifies that your heart is growing stronger and your cardiovascular fitness level is improving. Exercise will also help you better manage the negative effects of stress on your body. Aim for 30 to 60 minutes of moderate exercise each day. If your resting heart rate is 100 or higher, be sure to talk with your doctor about it. If you are not exercising regularly and you have a very low resting pulse, ask your doctor to check it.